The usual carnival-style music beckoned us into the pavilion in Smale Riverfront Park that houses Carol Ann's Carousel. On first sight, it looks like a traditional carousel. But every animal and painted medallion represents something about Cincinnati. Children can ride a UC Bearcat or one of the zoo's white tigers. I don't know why there is a grasshopper but am quite sure that some sort of law was passed years ago stating that a flying pig must be included in any new project built within the city's borders. 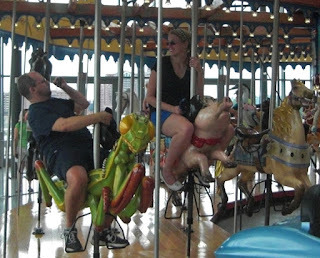 Who says carousels are just for children? All the sign says is that riders must be at least 42 inches tall.